Purest Colloids mission is to produce the finest colloidal products which provide the highest level of effectiveness whether throughcolloidal silver or other colloidal metals. In addition to our flagship product, MesoSilver brand colloidal silver, we offer superior metal colloid products for use as dietary supplements. Our colloids provide the body with minerals to maintain optimum health. By maximizing the particle surface area of the nanometer sized particles we keep our products in the forefront of quality and effectiveness. Our products, including colloidal silver and gold, have a broad range of other uses and have been used in the manufacture of photographic films, cosmetics, preservatives, antibacterial coatings, and dietary supplements. This web site discusses our products, MesoSilver®, MesoGold® , MesoCopper®, MesoPlatinum®, MesoPalladium™, MesoIridium™, MesoSilica™, and MesoZinc™. Their function is to provide minerals in trace amounts which our bodies can use to maintain a robust immune system for optimum health. 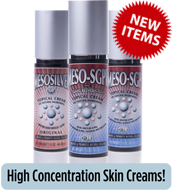 Read more about Colloidal Silver Effectiveness in the learning center. Concentration checks currently go back as far as mid 2010.
bottom of the informational label as shown in the example below. 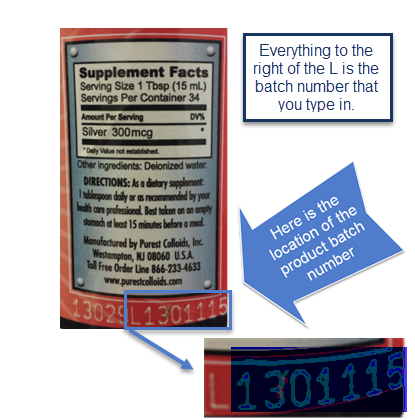 give far more technical details about our products than most people need. For thousands of years silver has been used as a healing agent by civilizations throughout the world. Its medical, preservative, and restorative powers can be traced as far as the ancient Greek and Roman Empires. Long before the development of modern pharmaceuticals, silver was employed as a germicide. Mesocolloids consist of pure elemental metal nanoparticles dispersed in ultra pure deionized water. The smallest sized nanoparticles are called mesoparticles. Mesoparticles are very small particles whose size is greater than an atom but smaller than conventional small particles. Size ranges from sub-nanometer to 10 nanometers in diameter and typically consist of 10 - 30,000 atoms per particle. Colloids consisting of mesoparticles have a particle surface area that is many times greater than colloids produced by other methods and are called mesocolloids. Mesocolloid is a trademarked name that refers to an entire group of metal colloids that are produced using the the mesoprocess. The term mesocolloid was coined by the scientists at the CSL who developed the method of producing colloids consisting of mesoparticles. 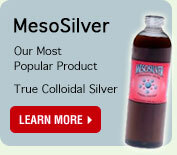 Meso-World shows the relative size of the colloidal silver particles in Mesosilver. For a constant concentration of metal nanoparticles, the particle surface area increases as the particle size decreases. In the chemical world, reactivity increases with increasing surface area. Therefore, the effectiveness of colloidal solutions increases with decreasing particle size as the particle surface area increases. For this reason, particle surface area serves as a metric for comparing colloidal solutions. In metal colloids the increase in reactivity that derives from the increased particle surface area translates directly to effectiveness of the colloid. Surface area is expressed in square centimeters (cm2) per milliliter (mL) of colloidal solution, and is written as (cm2/mL). Compared to colloidal products produced by other methods, Mesocolloids have the highest particle surface area because of the combination of small particle size and high concentration of particles. See the Comparison Table for comparitive examples of colloidal silver products. Mesocolloids are characterized by the small size of the mesoparticles that constitute the colloid and the high percentage of particles vs ions.